A new water park on Chincoteague island is nearing completion. It has been welcoming visitors for a couple of weeks, but it will have its grand opening celebration on Friday, June 29th at 3:00PM. 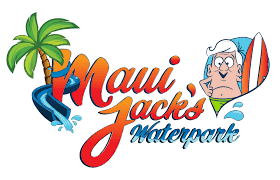 The waterpark, called Maui Jack, was built by Blue Water Development. The ribbon-cutting ceremony will be held by local dignitaries, representatives from Blue Water Development, owners of the waterpark, and officials from the nearby Chincoteague Island KOA campground. The ceremony will also include a raffle, which will have prizes such as a four-pack of day passes and a bag of Maui Jack “swag.” All attendees will receive discounted vouchers for future waterpark visits. The waterpark includes a Lazy River, Maui Island cabanas, a “North Shore Beach,” and four water slides: Typhoon, Pipeline, Diamondhead, and Banzai Racers. A new restaurant, Keko’s Bar and Grill, will offer food and drinks within the park. The restaurant will also cater the grand opening, offering complimentary appetizers, beverages, and a complimentary signature drink. The park had a soft opening on Memorial Day weekend of 2018 and is open from 10:00MA to 6PM daily. Maui Jack offers full-day, late-day, and 3-day passes, group pricing for birthday parties, reunions, and retreats, and special pricing for guests staying at nearby hotels. Located at 6742 Maddox Boulevard, we can’t wait to see the type of attention and crowds this addition will draw to our beautiful island. Just in time for the 4th of July! It was great to see the whole island out and celebrating yesterday.